Martinique is an island in the eastern Caribbean Sea, having a total area of 1,128 km². It is an overseas département ( département d'outre-mer, or DOM) of France. Like the other DOMs, Martinique is also one of the 26 régions of France (as a région d'outre-mer), and an integral part of the Republic. 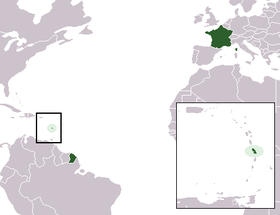 As part of France, Martinique is part of the European Union, the currency used is the euro. Its official language is French, although almost all of its inhabitants also speak Antillean Creole (Créole Martiniquais). Martinique is pictured on all euro banknotes, on the backside at the bottom of each note, right of the Greek ΕΥΡΩ (EURO) next to the denomination. Agriculture accounts for about 6% of GDP and the small industrial sector for 11%. Sugar production has declined, with most of the sugarcane now used for the production of rum. Banana exports are increasing, going mostly to France. The bulk of meat, vegetable, and grain requirements must be imported, contributing to a chronic trade deficit that requires large annual transfers of aid from France. Tourism has become more important than agricultural exports as a source of foreign xchange. The majority of the work force is employed in the service sector and in administration. Martinique's indigenous people were Carib indians. Christopher Columbus saw the island in 1493 but he didn't set foot on it until 1502 during his fourth voyage. However, Spaniards did not colonize the island. 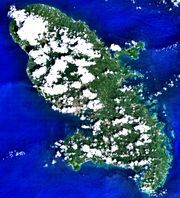 The first European to inhabit the island was the Frenchman Pierre Belan d'Esnambuc who founded a settlement on the island in 1635. His nephew Jacques-Dyel du Parquet bought the island and developed a rich and wealth colony. The island became a part of the French crown in 1658. Sugar, cocoa and coffee were the first crops to be grown on the island. Black slaves were brought to to island from West Africa. The Dutch and English navy tried to occupy the island. The island was under Britain's command during the Seven Years' War from 1762 to 1763; during the French Revolutionary Wars from 1794 to 1802; and again during the Napoleonic wars from 1809 to 1814. Slavery was banned in 1848. People from India and China were brought to work the farms. During WWII the island was controlled by the Vichy regime from 1940- 1943; later it was under the Free French Forces. As an overseas départment of France, Martinique's culture is basically French with a Caribbean twist. Its former capital, Saint-Pierre (destroyed by a volcanic eruption), was often referred to as the Paris of the Lesser Antilles. Following French custom, many businesses close at midday, then reopen later in the afternoon. The official language is French, although many Martinicans speak a Creole patois. Based in French, Martinique's Creole also incorporates elements of English, Spanish, Portuguese, and African languages. Originally passed down through oral storytelling traditions, it continues to be used more often in speech than in writing. Most of Martinique's population is descended from African slaves brought to work on sugar plantations during the colonial era. Today, the island enjoys a higher standard of living than most other Caribbean countries. The finest French products are easily available, from Chanel fashions to Limoges porcelain. Among young people, going to study in France is common. For the French, Martinique has been a vacation hotspot for many years, attracting both the upper class and more budget-conscious travelers. With all the interchange between the two regions, the people of Martinique are every bit as chic and sophisticated as their counterparts from the mainland.